Wed., April 3, 2019 11:59 p.m. | Wednesday, April 3, 2019 11:59 p.m.
A plaque dedicated to the officers killed on April 4, 2009, is seen outside of Pittsburgh’s Zone 5 station on Wednesday, April 3, 2019. 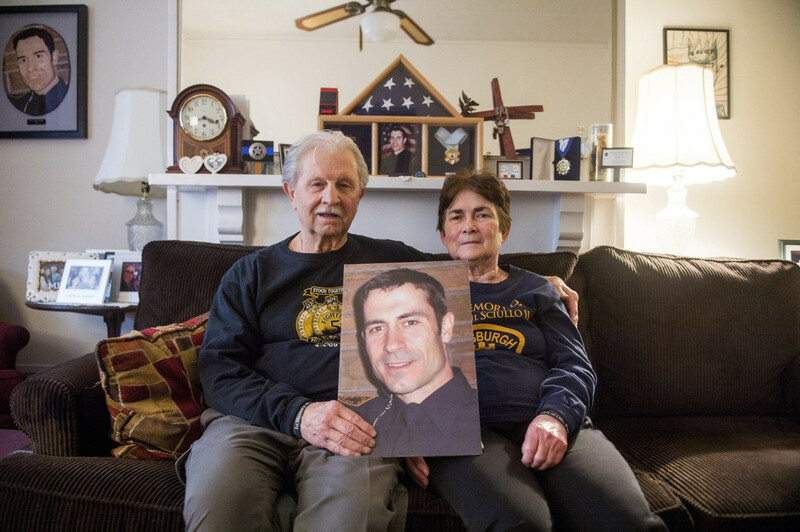 Paul ‘Max’ Sciullo and Sue Sciullo, mother and father of slain Pittsburgh police Officer Paul J. Sciullo II, pose for a portrait outside of their Bloomfield home on Friday, March 29, 2019. 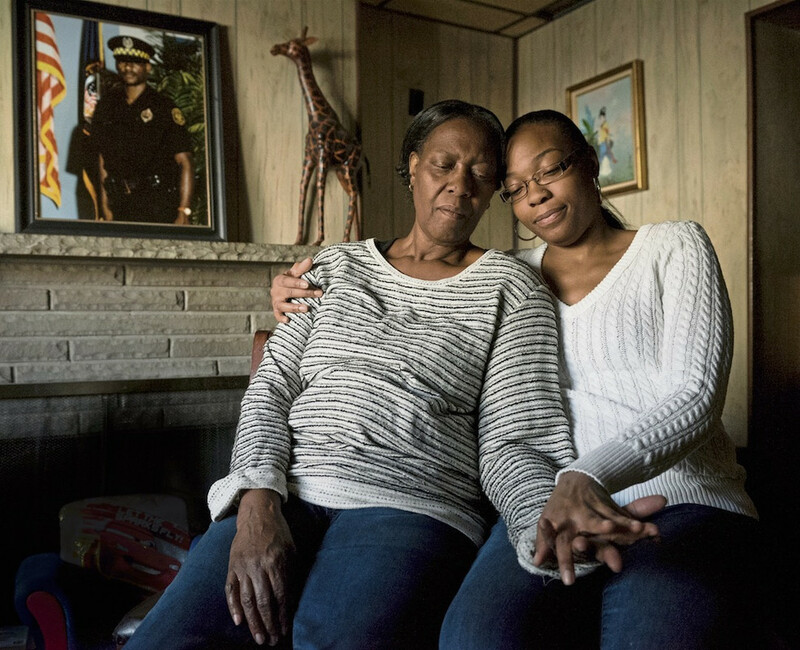 Frances Kelly, 68, and Danyelle Cheatham, 26, the mother and sister of Pittsburgh Police Officer Eric Kelly who was slain in the 2009 shooting at Stanton Heights, hold hands in their Fairywood home near a portrait of Eric Kelly, Wednesday, Dec. 14, 2016. 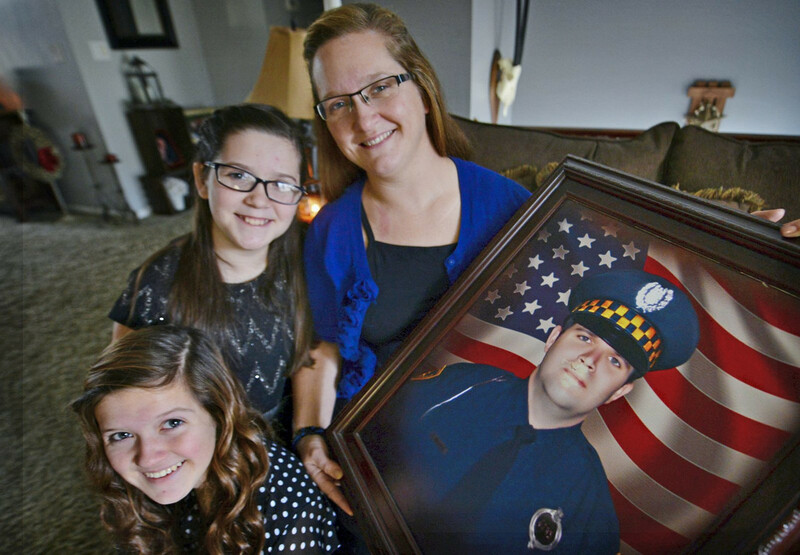 Shandra Mayhle-Rhine, and her two daughters, are pictured with a photograph of Officer Stephen Mayhle, who was killed in then line of duty in 2009. It’s April 4 again, but that doesn’t matter to Frances Kelly. Something each day takes her back to this date in 2009. Something makes her think of her son, Eric Kelly, and reminds her that he’s gone. Little inconveniences — getting a flat tire or needing to get the car inspected — make Frances Kelly think of her son because she knows he would have happily taken care of them for her. For Sue and Max Sciullo, each day also is a reminder of their son, Paul Sciullo II. After 10 years, Zone 5 police officers still drive by their Bloomfield home and check in on the couple. They still hear stories about Paul, and officers from Pittsburgh and beyond still stop them on the street for hugs. And for Shandra Mayhle-­Rhine, the trauma of losing her husband Stephen J. Mayhle on this date 10 years ago also remains fresh. She said it gets worse when the anniversary comes around each year. Ten years or just yesterday, it doesn’t matter. Time doesn’t heal, surviving family members say. It just passes. “As much as they say time heals, that’s just something you have to live with,” says Sue Sciullo. Pittsburgh police Officers Sciullo, 37, and Mayhle, 29, responded to a domestic disturbance call that came in just after 7 a.m. on April 4, 2009. A mother wanted her 22-year-old son out of their house on Stanton Heights’ Fairfield Street after an argument. When Sciullo and Mayhle, both two-year veterans of the force, walked through the front door, the gunman opened fire. Officer Kelly, 41, had been on his way home when he heard the radio call for help. He dropped off his daughter and rerouted to Fairfield Street. His car came under fire as soon as he arrived, and the 14-year department veteran was hit again when he tried to reach Sciullo and Mayhle. All three officers were killed. Eric Kelly’s love of family, his trips to see his mother when she worked at Wendy’s, his love for Christmas and the Pittsburgh Steelers — those are the things Frances Kelly says she misses most. Ten years on, Frances Kelly said the loss still hurts and she misses her son. Holidays are hard. Birthdays are hard. Each day is hard. Eric Kelly’s sister, Danyelle, still has the urge to call him with her problems and her accomplishments. Ten years ago, she was in high school and she called her big brother — 22 years older than her — for everything. She continued: “Now 10 years later, you have adult issues. Now it’s the real world, now you have kids and you have a career and you’re going through things and you’re accomplishing goals that you want to share with this person who has been there your whole life and has been rooting for you. His daughter, Autumn, said family meant everything to her father. She called him the glue that held the family together. Frances Kelly talked to her son two or three times a day. If he was working Downtown and had a break between court appearances, he’d stop by her house and shower. Then he’d take a nap on the floor and remind her to wake him up before he had to be back Downtown. She said she still talks to him every day, all the time. He’s still around, his family said. Autumn’s daughter dreams of him and tells her mother of in-depth conversations with him. Danyelle’s 7-year-old son shares a birthday with the uncle he never met. On the day Sciullo died, his mother said, he was the happiest he’d been in his life. That happiness is something they think about often, she said. “We’re stay-at-home people,” said Max Scuillo, but their son has continued to keep them active even after his death. There have been invitations to ceremonies for awards named after Paul, the rededication of a baseball field in Paul’s name, scholarships presented in his name. “It still goes on and on,” Sue Sciullo said. Despite the passage of time, they recall that day clearly. She remembers turning on the Saturday morning news and seeing an incident in Zone 5. She remembers she couldn’t get hold of Paul, and she asked her husband to drive to his house a few blocks away. She remembers thinking that maybe her son got sick overnight and went home and turned off his phone. She remembers Max driving to Stanton Heights when Paul wasn’t at home, where other officers took him to headquarters and he met his wife and daughter. Sue remembers the others, too. For months afterward, they were haunted by the thought that their son had suffered — it took hours for anyone to safely get to him, and though they’d been told he died instantly, they couldn’t know for sure. One night, Sue Sciullo looked out the window and saw a police car. She went outside to find one of Paul’s friends, a fellow officer. He started to cry. He told them he’d gone to bed and awakened to a bright light and saw Paul in his room. He said Paul asked him what had happened, and they walked and talked and Paul said he was OK. They could know now that he didn’t suffer, she said. They also know he’s still around. The memories come often for Stephen Mayhle’s girls. Playing in the snow with their dad. Hide and seek with dad popping out of a closet to scare them. Knocking over the dominoes he used to set up in spirals around the house. Making time for the girls before leaving for an overnight shift at Pittsburgh’s Zone 5 police station. Those are the good memories. The bad ones bring tears. He won’t be there for a father-daughter dance, or senior prom, or their graduation. He won’t be able to give them away at their weddings. His girls — Jennifer, 16, and Brooklynn, 13 — were 6 and 3 at the time. They don’t dwell on his absence, but they think about it often. Most of the time, the memories bring smiles. Brooklynn doesn’t remember her dad like her sister does. “I remember the day he left, and …,” Brooklynn said, unable to continue. Her mother, Shandra Mayhle-­Rhine, picked it up from there. “She remembers thinking she didn’t know that was the last time she was going to say goodbye to him,” she said. The girls and Shandra celebrated Stephen’s birthday on April 3, 2009, before he left for work that night. They had the dining room table decked out in a baseball theme and put up streamers. Stephen loved the Pirates. Every year, he said the team would win the World Series. “Then he left that night for a night shift, and that was it,” Shandra said. The streamers remained for at least a year. For Shandra, who has remarried and now lives in Leechburg with her girls, husband and his two teenage daughters, the pain is worse on each anniversary of the tragedy. Shandra said an organization that provides support to spouses and children of fallen police officers — Concerns of Police Survivors (C.O.P.S.) — has been an immense help. The group has summer camps for kids, which Jennifer and Brooklynn regularly attend. Parents must attend camp with younger kids like Brooklynn, and the organization provides counseling for adults and children. Shandra said raising four teenage girls keeps her busy and she has a support group made up of widows of local police officers who were killed in the line of duty. “We don’t have to explain anything. We understand what each other’s been through,” she said. The passage of time has eased some of the pain, and the girls are looking forward to graduating from high school and college. Jennifer loves Pittsburgh. She hopes to attend the University of Pittsburgh and become a paralegal. Brooklynn plans to do something with computers and work in an office. She giggled hysterically when she said she hopes to marry “Spider-Man” actor Tom Holland. Neither would object to marrying a police officer, although Jennifer would be hesitant. “I guess it depends if the guy I love is a policeman, but I’m still set on Tom Holland,” Brooklynn said. Mother and daughters said they are proud of Stephen. They remember him as an amazing husband and loving father, and they miss him sorely. “I’m proud to know that I can say that my dad was a hero,” Jennifer said. Megan Guza and Bob Bauder are Tribune-Review staff writers. You can contact Megan at 412-380-8519, mguza@tribweb.com or via Twitter @meganguzaTrib. You can contact Bob at 412-765-2312, bbauder@tribweb.com or via Twitter @bobbauder.